The intent of this page is to serve as an online portfolio for the variety of work I have been involved with over the past few years. These photos represent a spectrum of the projects, styles and level of detail that I can offer. Thank you for your time and interest to find your way here to this website. Take a look around and please feel free to contact me regarding any and all of your woodworking needs. Services- Design, Fabricate, Finish and Install. Loud Woodwork offers a range of services and products related to "Most Anything" made of wood. 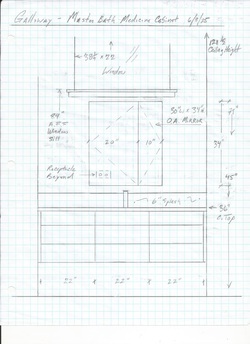 From fabricating custom kitchen and bath cabinets for the areas leading architects and designers to working with homeowners to design one of a kind furniture or "built-in" cabinets to suit their personal style and space. Entry door fabrication and hardware installation is a specialty as well while professional finishing and general installation services are also available upon request. I have had the good fortune to make a career out of the very thing that I find most gratifying in life, the simple pleasure of creating useful, beautiful and enduring objects. I truly enjoy the endless challenges in the conception, fabrication and completion of any woodworking project. I think this is reflected not only in the end product but in the process as well. I strive not only to create an exceptional product but to provide exceptional service. Understanding, meeting and exceeding the clients expectations is the real measure of success for me. My first woodworking project. Age 3-4? I hope. I have spent my entire working career in the custom woodworking world. The course was set long ago when, as a child, I began utilizing the array of tools left behind by my grandfather. Upon entering high school my shop classes with Bill Vick quickly became the focus of my day and I knew then that this is what I would pursue as a profession. After graduating I entered into the Wood Technology Department at Pittsburg State University. My formal education was reinforced through summer and winter breaks with an apprenticeship at Haley Pearsall Cabinetmakers in Manakin, Virginia. Graduating in 1998 with a Bachelor of Science in Wood Technology I returned home to Richmond, Virginia to work full time as a "journeyman" cabinetmaker with Haley Pearsall. There I continued to learn all aspects of fine cabinetmaking start to finish. Moving to Asheville, North Carolina in 2004 opened up my world professionally to an amazing array of opportunities. Here I have been focused primarily on architectural woodwork, entry doors and window systems. while continuing to build cabinets, furniture and "most anything"people ask for. 2013 marked my first endeavor into teaching woodworking at Haywood County Community College. My first class focused on utilizing found and salvaged materials while learning about the fundamentals of woodworking. This was quite a learning experience for me and was a great way to convey some of the tricks of the trade I have learned over the years to a new generation.